Choice of Red or Black 4 pot Calipers. 330mm x 28mm J Hook or Grooved Discs. Redesigned for extra reliability and rotational weight saving. Why settle for less than perfection. 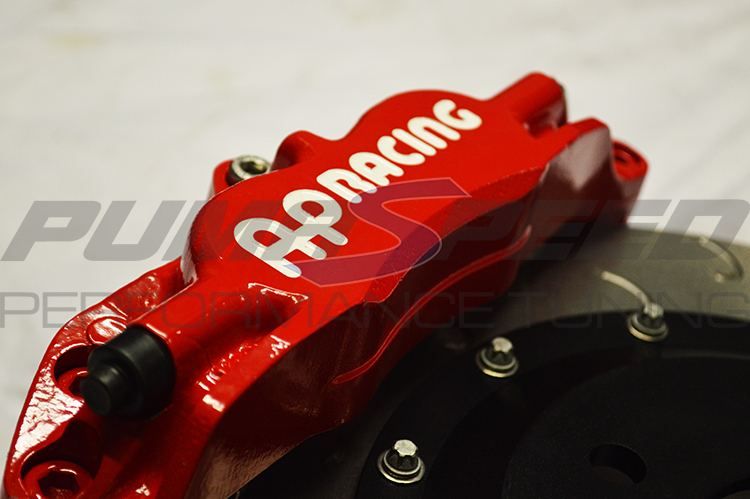 This 330mm AP Racing 6 pot Big Brake Kit for the Fiesta ST is the Brake Kit of choice for the serious road user and the Professional Motorsport Racer. The Kit includes a pair of 4 pot AP Racing calipers (Choice of Colour) and a pair of 28mm width discs at 330mm (Choice of groove Design). It will suit all Fiesta Mk7 and Mk7.5 Ecoboost with suitable aftermarket wheels with clearance to suit Caliper width. This kit is supplied with all the required mounting brackets, bells etc and either Ferrodo DS2500 pads or Mintex 1144. These kits are the perfect compliment to wheel, tire, and suspension upgrades on daily drivers, competition vehicles, and custom styled show machines. This AP Brake kit is engineered to the ST180 and Mk7 Fiesta Range, it maintains full compatibility with the OE Master Cylinder Output and factory ABS functions. Optional Caliper finishes and Rotor designs enable the builder to personalise the style and optimise brake performance for every individual application. For options please contact the Pumaspeed Sales Team on 01924360260. The Pumaspeed Workshop team are ready to fit the AP Racing 4 Pot 330mm Brake Kit Fiesta ST180 in our Head Office located here. Therefore making parts and labour a total cost £2,033.99 (inc. VAT). Pumaspeed have a specialist distribution team that can dispatch the AP Racing 4 Pot 330mm Brake Kit Fiesta ST180 to any destination worldwide.